The Georgia Gameday Center is an entire hotel, dedicated to game days. How cool! 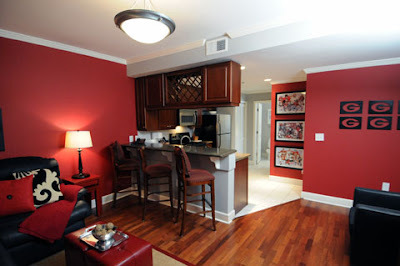 It's located in Downtown Athens (in walking distance of the stadium) and offers a pretty unique, lodging experience. 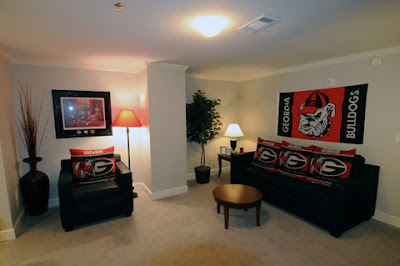 All of the rooms are decorated in UGA themed, red and black decor. 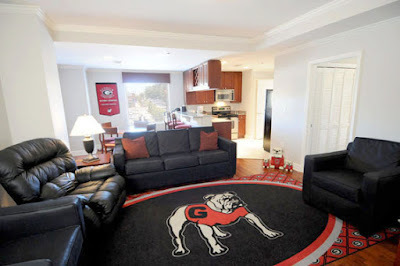 Loving the huge Bulldog rug in the first picture. 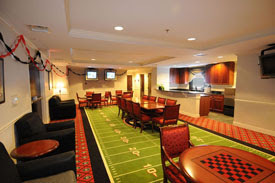 They even have rooms for pre-game parties. Are there more of these hotels across the country? If not, there should be. I would love to know if other college towns have similar gameday hotels. As for other schools I know that UNC Chapel Hill has one of the most stunning Inns in the country including a 5 star restaurant. It's truly spectacular. Thanks so much for the info and comment. Do you know where I can find additional photos? Would love to see the renovations. I checked their website. I love that Uga get his own room, that's so cool. I will check out the UNC Inn also.